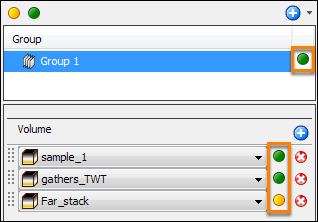 Once you have created groups to group your volumes, you can enable or disable the groups. Similarly, you can do the same for specific members in a group. In the Control Panel, open the Group tab. All the groups you have created will be displayed in the Group tree. Select the group that you want to enable/disable. At the Group row, click the green circle to disable the group. The circle will turn amber, indicating the group is inactive. To enable the group, click the amber circle and the circle will turn green, indicating the group is now active. Select the group that you want to enable/disable its member(s). At the row of the group member in the Details Panel, click the green circle to disable the volume in the group. The circle will turn amber, indicating the volume in the group is inactive. To enable the group member, click the amber circle and the circle will turn green, indicating the volume in the group is now active.